Today Apple (NASDAQ:AAPL) held a special event at the Steve Jobs Theater in Cupertino. After spending most of last week week rolling out new hardware with little fanfare, the company pulled out all the stops today. 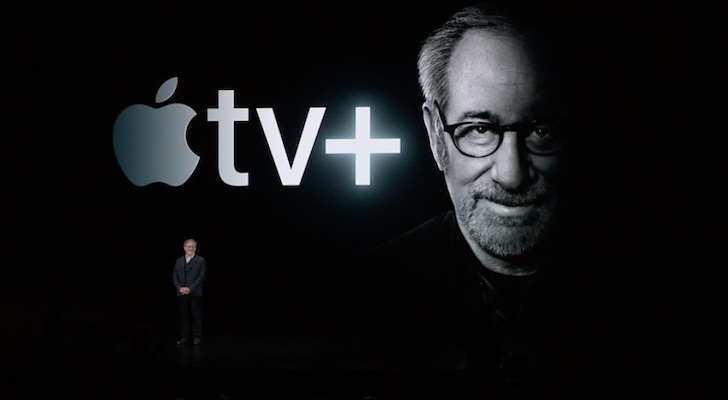 The big announcement everyone has been waiting for is Apple TV+, Apple’s new video streaming service. We now know what it is and when it will launch. The company also confirmed a focus on services, with a series of additional subscription-based offerings and its own credit card. Apple stock growth for the past decade has been driven by the iPhone, but the company is looking to services like Apple Music and Apple TV+ to take a leading role in revenue generation for the future. Here’s everything you need to know about what Apple revealed today. The big news everyone was waiting for today was Apple’s video streaming service. It’s called Apple TV+ and it arrives this fall. Apple is releasing original content for Apple+ and highlighted shows coming from Steve Carell, Jennifer Aniston, Reese Witherspoon, Steven Spielberg, Jason Momoa, Kumail Nanjiani, Oprah Winfrey and others. Apple TV+ is ad-free and content is downloadable for offline viewing. Pricing was not announced. Also new is Apple TV Channels, in a newly revised Apple TV app. The app will be a hub for paid services like Hulu, movies from iTunes, network TV apps, live sports — and Apple TV+, of course. Content is all played within the Apple TV app. Customers can subscribe to services within the app, instead of having to sign up on a website. The new Apple TV app launches in May (fall for the Mac), but in a big move, it will also be rolled out for smart TVs Roku (NASDAQ:ROKU) devices and Amazon (NASDAQ:AMZN) FireTV streamers. AAPL is pushing the trusted angle of Apple News, positioning its app as a source that offers content based on reputable sources rather than headlines that have viral click potential — that was a definite dig at Facebook (NASDAQ:FB). Apple News+ is a new paid, subscription version that adds access to over 300 magazines to the app. Also included is access to several large newspapers, including The Wall Street Journal. Continuing the trust theme, AAPL says publishers will not be able to track readers. The cost of a subscription is $9.99 per month (including full family access), with the first month free, starting today in the U.S. and Canada. With Apple Pay on track to hit 10 billion transactions this year, AAPL is introducing its own credit card. Apple Card arrives in minutes after application, within the iOS Wallet app, and it’s accepted anywhere worldwide that accepts Apple Pay. Apple Card’s transaction history — made more readable using machine learning and Apple Maps — will reside in the Wallet app as well, along with spending and balance. AAPL is offering a rewards system called Daily Cash that offers 2% cash back on purchases (3% back on purchases from Apple), paid daily, along with simplified payment options. Apple is partnering with Goldman Sachs (NYSE:GS) and Mastercard (NYSE:MA) for the Apple Card. For locations where Apple Pay is not accepted, a physical card (made of Titanium) is also supplied. Apple Card comes to the U.S. this summer. Leveraging the popularity of game apps on the App Store, Apple Arcade is a subscription service for mobile, desktop and “living room” games (iPhone, iPad, Mac and Apple TV). All games can be played offline, so internet access is not required to play once downloaded. There are no ads, and no in-app purchases. AAPL is providing financial backing for some developers to ensure high quality, exclusive titles: over 100 at launch. Apple Arcade launches this fall, but pricing was not announced. Will Apple’s new video streaming service be a potential Netflix (NASDAQ:NFLX) killer? That’s doubtful, but Apple TV+ should be a solid contender that quickly racks up subscribers. The key advantage AAPL will have – besides original content not available through other services — is the ability to put its offering front and center on every iPhone, iPad and Mac computer. That’s over a billion devices (plus all those third party streamers now supported), and that same advantage helped to rapidly grow Apple Music from a standing start to the world’s second largest music streaming service that now claims 56 million paying subscribers. Apple stock has been on a roll through March, gaining 10% through the month as excitement built for the big event. We’ll find out shortly whether investors remain confident in Apple TV+ and the company’s services push. Article printed from InvestorPlace Media, https://investorplace.com/2019/03/apple-stock-aapl-tv-plus-card-gaming/.